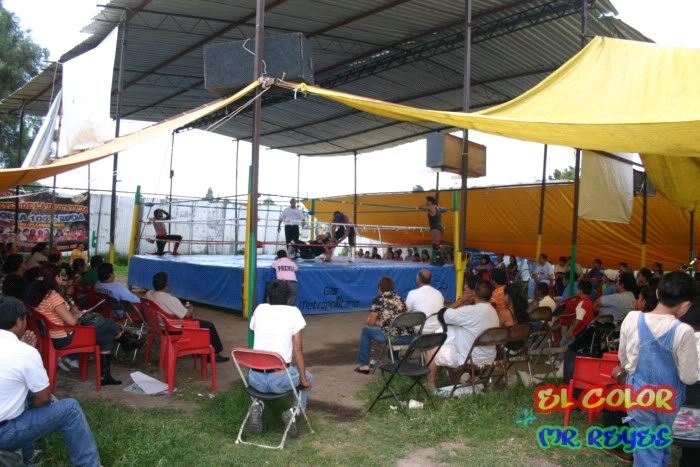 Arena Coliseo Coacalco is the name of an outdoor ring outside of Mexico City. The ring is beneath a large tent, in a grass field, next to a Toyota dealership. El Justiciero runs the shows, which take place every Sunday and usually feature a lot of trainees, their trainers, and sometimes a few stars from elsewhere. The arena opened on October 16, 1997. Coliseo Coacalco's location is Allende 7, Colonia San Lorenzo Tetlixtac, CP 55714 San Francisco Coacalco de Berriozabal, México, México. Seating capacity varies. There's an amount of folding chairs to sit, but many people watching are standing. This page was last edited on 16 October 2016, at 10:33.